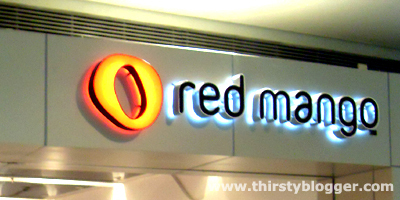 If you’ve been to Red Mango, then you probably know that it’s a place where you can have some delicious all natural frozen yogurt. Yogurt that’s creamy and nutritious because it has live and active cultures that’s good for your body. And since you’re already eating (or slurping) on something healthy, then you might as well drink something healthy too, right? And that’s where Red Mango’s Iced Green Tea Latte comes in. At first glance, it doesn’t really look healthy. 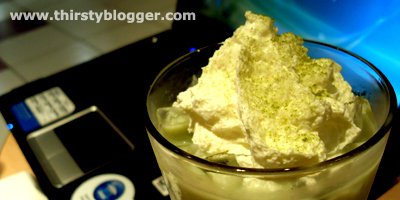 Maybe because it looks so fattening – being topped with whipped cream and all. But the manager in Red Mango Megamall says it’s healthy and has only 160 calories. Well, that’s around half of the calories in, say a Dark Roast Coffee Frappuccino in Starbucks. So okay, calorie-wise, it’s better. Well, I’d say it’s above “okay”. I honestly think this drink would be better if it was ice blended – but that’s just me. 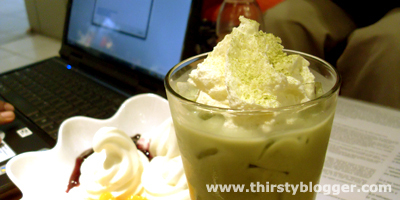 Nevertheless, Red Mango’s Iced Green Tea Latte is refreshing and would be enough to quench your thirst after having some of their frozen yogurt. So that’s it for today’s drink review. If you’re interested to know more about their frozen yogurt, then I suggest you read this article in Patay Gutom. Woot!